Healthy Fruity Cobbler — Welcome to Fitty Foodlicious! This month has been crazy so far and it's only Friday, the 13th. How are we halfway through the month already? I don't even know. Between heading to San Diego for BlogFest and my mother-in-law being very ill, it seems July is just a nonstop, super packed, super stressful month. When I got back from San Diego I wasn't feeling well. I had a cold from all of the travel and lack of sleep and I just didn't feel like myself. I felt tired, undermotivated, and downright exhausted. I realized through all of these feelings that if I kept going at the speed I was, I would end up in the hospital, because there is only so much go, go, go a person can take before the body says no. After seeing my mother-in-law hooked up to machines, barely being able to breathe or form a sentence, I realized this life is to short to be spending any time being unhappy or exhausted. Rest is so important in our fast-paced world of go, go, go, stop until you drop mentality. I need rest and time. Time to process, time to heal, time to get some perspective and focus on what really matters: health, family, and being around people who truly support one another. Rest is also really important so that's why I've decided to walk away from my wedding business after 2019. There are many big personal reasons for this decision, but it's also because I need more time to breathe and live. I need more time to slow down and take it easy, as the Eagle's say. If you've never heard that song, please stop reading this and go google it now, give it a listen and then come back and finish reading this blog post. Okay, now that you're back from hearing one of the best songs ever, that song is where I'm at in life right now. I need to take it easy. I need to be there for my husband during this extremely difficult time. Life is to short to be unhappy. 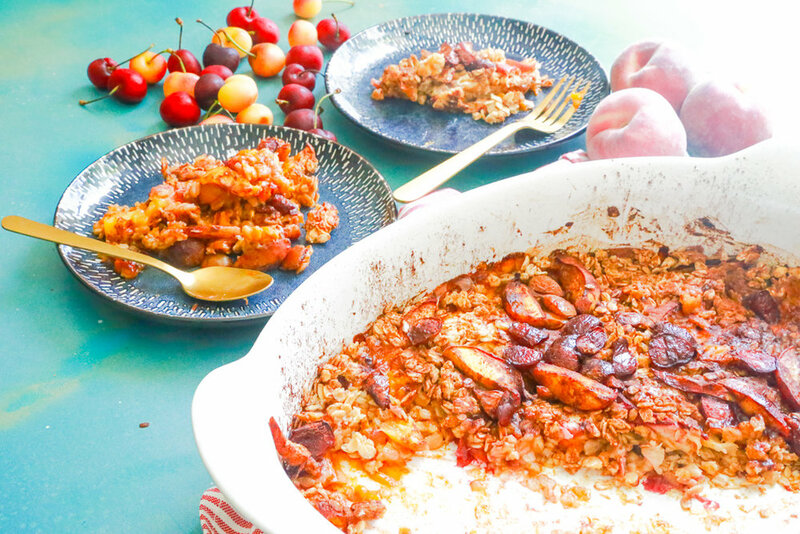 One thing that does help people during difficult times is comfort food and let me tell you my healthy fruity cobbler is going to knock your socks off! It's easy to make, tastes delicious, and can be made using any fruit you have that sitting on your counter that needs to be used up. You can use strawberries, bloobs, grapes, apples, the possibilities are endless! 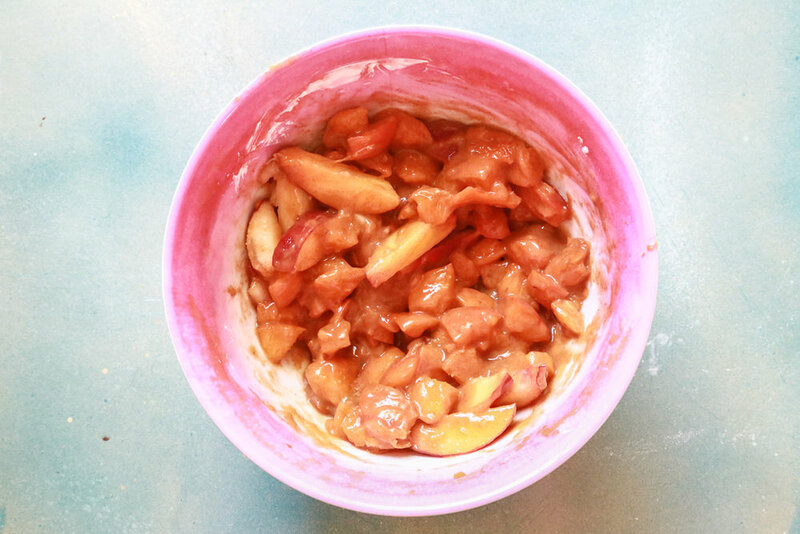 For this recipe, I used juicy peaches, nectarines, cherries, and plums. It's nectarine season here and I pretty much eat 5 a day so adding them to my fruity cobbler was a must-do. You will also need oats for this recipe and flour. If you are gluten-free, you can use almond flour. And despite what many people think, oats are gluten-free! PRESS PLAY on the recipe video below! For the fruity mixture use as much or as little cinnamon as you prefer. I wanted this fruity cobbler to be extra spicy so I used a lot of cinnamon, but if that isn't your jam, use less cinnamon. This recipe is super easy to make and literally takes five minutes to get into the baking dish. Make sure your baking dish is greased and that your oven is set to 350-degrees. Well, what are you still doing here? Go bake this now! 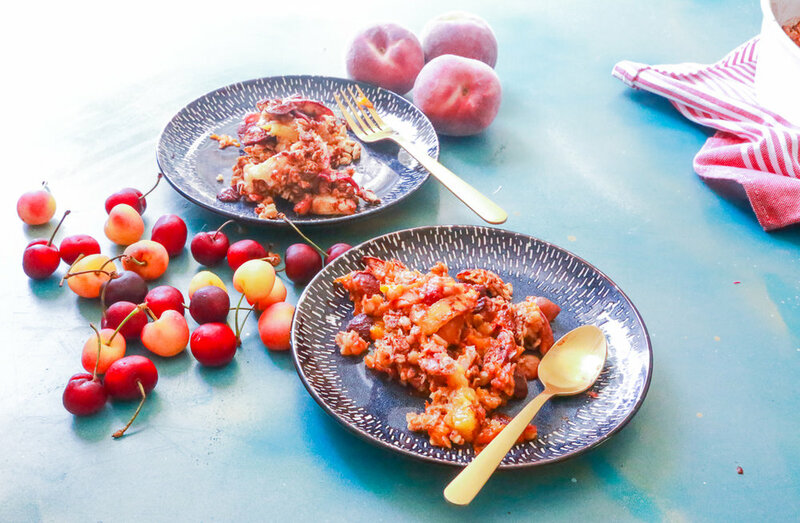 This delicious, easy, healthy fruity cobbler will be the hit at your dinner table and it’s the perfect summer dessert! Got leftover fruit? Make this today! In a medium mixing bowl, combine part of the sliced peaches, baking powder, vanilla extract, and cinnamon. Add more peaches and combine again. In a separate mixing bowl, add the oats and combine the oats, flour, melted butter, and honey. Combine all of the ingredients well. Place the peaches in a greased baking dish. Next, top the peaches mixture with the oats and combine everything together again. Top with cinnamon and then layer the cherries and plums on top of everything. Add as much cinnamon as you like! Bake at 350-degrees for 20-25 minutes or until the cobbler is nice and crispy. Garnish with whipped cream or ice cream, if desired.